Corinne: Planning a wedding from hundreds of miles away can be a daunting prospect, so leading up to the big day, I braced myself for things to go wrong. Thanks to my super chill future husband who also helped quite a lot with planning and execution, a fantastic support system of family and friends, and some wonderful vendors, most everything went swimmingly, and when a few things did go haywire, I didn't have to handle them alone. I will always remember how loved I felt this day, by my husband (of course), but also by my friends and family. And love is what weddings are truly about, so all was well. Grant: I'm usually a bit nervous at a big event, so that's what I expected to feel on my wedding day. However, I was surprised to feel the opposite. I was feeling excited and so grateful that I was about to make a vow with my best friend. All the small things we put into our wedding to make it our own was a lot of fun. Seeing our friends and family walk down the aisle to the Jurassic Park theme, the wedding party holding books instead of flowers, and using dry ice effects made it that much more personal to us. Grant & Corinne are one of the sweetest couples this year. They're both bookworms and movie buffs and during the ceremony & reception it really showed. Just by being around them it was apparent that the love they share will last a lifetime. 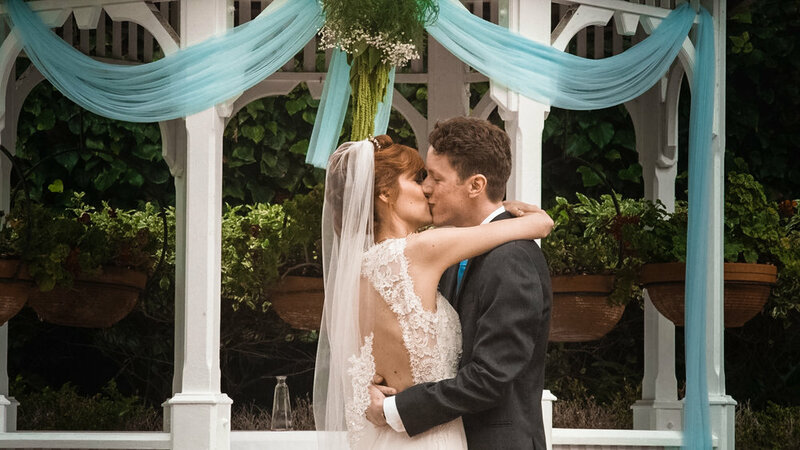 Getting married at a 100 year old hotel in the heart of Laguna Beach added another layer to this wonderful love story. Congratulations Grant & Corinne, may your love last to infinity and beyond.